a blog about travel, technology, food and life. My name is Grace. I'm a Southeast Asian lady who loves to travel. I currently live in California with my awesome little shih tzu. I mostly blog about my adventures/misadventures as an F.O.B. in America, my personal projects (I collect hobbies), food, technology and a heck of a lot of other random things. Slate.com is featuring a five part series on how the US military captured the Iraqi dictator which you can read here. Apparently it took a fat man, a resourceful soldier and Facebook to pull it all off. I know it sounds a bit oversimplified. 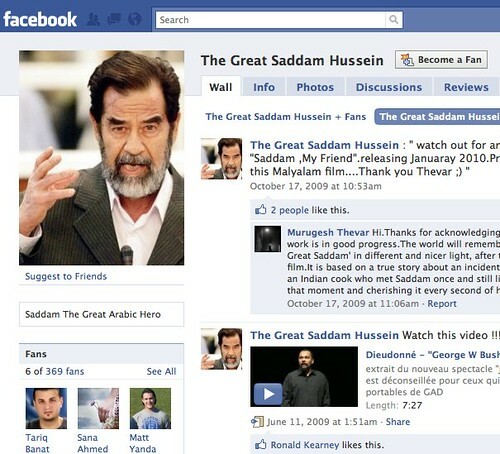 But essentially with the leadership of Colonel Hickey (resourceful soldier) the military decided to shift their approach in searching for Saddam Hussein by taking into account his personal relationships, charting it out (ala Facebook) and then pinpointing a particular connection (the fat man) that eventually led them to him. It seems that their previous approach of mapping out Saddam's connections were similar to that of an organizational chart. They were going after people who he worked with in the past like government allies or ranking officials. However, Iraq has a strong tribal structure such that most of Hussein's top men were those that had strong personal connections with him and most are even related to him. Now here is where the social networking theory or...err...more of the metaphor of social networking sites like Facebook come in. You see much of them work in the same mechanics as tribes do. In fact, social networking on the internet is more or less a centralized platform for tribal behavior rendered into modern format. If you actually visualize your connections on Facebook you will find that commonalities between you and your friends are often derived from shared interests and groups that you belong too. (Read Write Web features a nice app for this called Nexus here) Of course, you also have connections that are little on the fringe and may not make a lot of sense to your other friends at first look. Nonetheless they are as meaningful to you for reasons that, well sometimes, may only be known to you (it's ok we all have our little secrets). "However, perhaps one other thought might already have crossed your mind. If U.S. soldiers could construct a Facebook-like page of Hussein's relationships three months before Facebook was even launched, what kind of information is now laid bare for much less sophisticated minds to enjoy? Information about you, I mean."